That old saying “they were born with it!” doesn’t truly apply to having a healthy mouth. Some people are less prone to getting cavities, but having a healthy mouth isn’t a matter of luck, it has much more to do with having good habits. The truth is the most common dental problems can be prevented with good daily oral hygiene, maintaining regular dental checkups and a living a healthy lifestyle. The following tips are provided by The Centers for Disease Control and Prevention’s Division of Oral Health to achieve and maintain healthy teeth and gums all throughout your life. Brush and floss daily to clean your teeth and gums. Gently brush your teeth at least twice a day paying special attention to your gum line. Brushing helps remove food and bacteria from your mouth and teeth. Floss at least once a day to remove food and plaque that gets stuck between your teeth. For best results replace your toothbrush every three to four months, or sooner if the bristles are frayed. 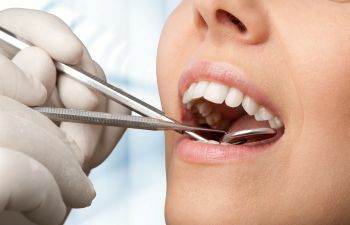 Visit your dentist with regular dental checkups. Maintaining regularly scheduled dental appointments helps to identify dental problems early, before they become problematic. Dental problems that are detected early can be more easily treated. Stay away from using tobacco products. It is a fact that smokers are four times more likely to develop periodontal disease (gum disease). All types of tobacco including pipes, cigars and smokeless tobacco increase the risk of oral and throat cancers. Tobacco users also have a higher chance for developing candidiasis, an oral fungal infection. Chewing tobacco contains sugar, and users are more likely to develop tooth decay. To benefit your teeth, avoid snacking on sugary or starchy foods, especially between meals. It is better for your health and teeth to eat plenty of fruits and vegetables. These healthy choices help stimulate the flow of saliva. Saliva helps remineralize tooth surfaces and clean teeth to help prevent tooth decay. It is important for your health to limit alcoholic drinks. Research indicates that heavy drinking increases the chances of developing oral and throat cancers.